Thank you for purchasing the Lucca M58 espresso machine. In this manual, you should find everything you to need to operate and maintain your machine. Please read carefully before using your machine. And if we've missed anything, you always know how to contact us. Let's get started! Included with the wood kit: 3 panels (right, left, rear), 1 bottomless portafilter with wood handle and chrome tip, 2 joystick wood knobs, 1 brew lever wood knob. NOTE: ALWAYS KEEP YOUR ORIGINAL PACKAGING IN CASE OF RETURN FOR SERVICE! When you receive your LUCCA M58, please inspect the box it came in for damage, if you noticed your box is damaged or any other damages as you set up your machine please contact us at hello@eightouncecoffee.ca at your earliest convenience to troubleshoot. Damages need to be reported to us within 3 business days so we can properly handle the issue. Once you’ve inspected your box lift machine out of its box and place it on the counter by grabbing it by the back of the machine and the group head. Having two people lift the machine is very helpful. After the machine is on the counter, remove the bag covering the machine and inspect the machine for damages. If you see any damage, call us right away. We highly recommend holding onto the box and shipping supplies inside the box in the event you need to ship or stow your machine. Remove and fill the water tank to a few inches from the top of the tank. It is very important to use properly filtered and softened water for your espresso machine. You can test your water hardness using the water test strips provided with the machine. The ideal water hardness for an espresso machine is 50 ppm. If you have any questions about this please check this useful guide at clivecoffee.com/water. 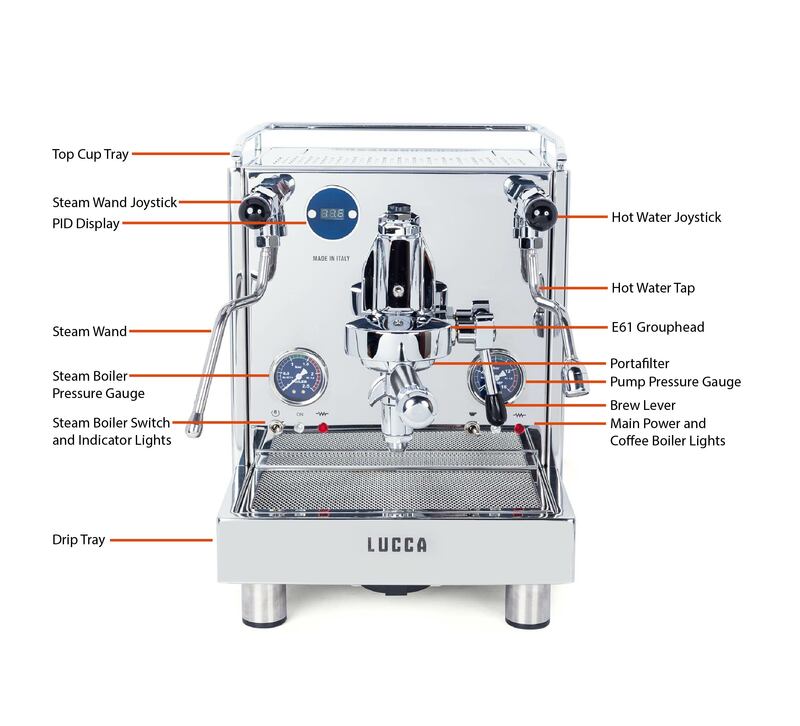 Your LUCCA M58 comes with a braided water line that connects to the water inlet on the bottom of the machine and has a 3/8ths OD push connect fitting on the other end to direct connect to a plastic water line. Once plumbed in flip the switch that is to the left of the water tank from “tanica” to “rete”. If you plan on plumbing in your own water kit to the braided line that doesn’t use a 3/8ths OD plastic tubing you’ll need to find an adapter for the braided line as it has a 3/8ths BSPT threaded female connection. Standard pipe thread in North America is NPT thread. WE HIGHLY RECOMMEND YOU PUT A FILTER AND SOFTENER IN YOUR WATER LINE. You can test your water hardness using the water test strips provided with the machine. The ideal water hardness for an espresso machine is 50 ppm and the ideal psi is between 25 and 45. If you have any questions about this please check this guide to water quality. When machine is set up and ready, flip the power switch on to turn the machine on. When the machine is on it will auto fill the steam boiler until it is full. Once the steam boiler is finished filling, lift the brew lever and allow the coffee boiler to fill until six ounces of water have run through the group head. • Open the hinged reservoir door on the top of the machine and remove the water reservoir. Rinse the water reservoir out and fill with cold softened water and then install it back into the machine being careful not to spill any water inside the machine. • Be sure that the silicone line is sitting in the bottom of the reservoir like shown. There s a notch on the right side of the reservoir for the line to sit in and the float should be on the left side of the machine. • Make sure the silicone line is not pushing the float down or the PID and heating lights will not turn on. • Before plugging the machine in, verify the steam and hot water knobs are closed and the brew lever is in the down position. Also make sure the power switches are in the off position and the drip tray is in place. • Plug the machine into the outlet* and then turn the coffee boiler power switch to the on position. • The pump will come on to fill the boilers and then will turn off after the boilers have completed filling. • If the pump turns off and the PID and heating lights do not come on then the water reservoir needs to be refilled. It may take 2 reservoirs to completely fill both boilers. • After the boilers have finished filling then place whichever portafilter you intend to use into the group head. Then lift the brew lever to activate the pump and keep the lever up until water comes out of the portafilter for at least 15 seconds and then lower the brew lever. • The heating indicator light and PID will illuminate and the machine will start heating. You will hear some gurgling noises and a small amount of steam and water will be discharged into the drip tray. This is normal to allow for the release of air and the expansion of water in the boiler. • If you plan on steaming milk or using the hot water wand then also be sure to turn on the steam boiler power switch. The coffee boiler power switch must also be on for the steam boiler to operate. • The machine should reach temperature in approximately 15 minutes, but to make delicious espresso with thick rich crema it is necessary to allow the machine to be heated for 30-45 minutes with the portafilter kept in the grouphead. * The electrical outlet must be a 3 prong 115V grounded outlet. No adaptors or extension cords should be used. A timer may be used to turn the machine on and off, but it must be a 3 prong grounded timer rated for 15 amps. A GFCI outlet is highly recommended but is not necessary. The machine is now on and heating. To turn on the steam boiler flip the switch on the left side to the on position. The machine is preset at 202 degrees for the coffee boiler and 260 degrees for the steam boiler. If the water tank runs low on water, the PID will shut off and the machine will stop heating. Once the water tank is refilled and in place the PID will turn back on the machine will continue heating. Once the PID reads that both boilers have stabilized at set temperature, the machine is ready for use! While the machine is on: press both power buttons at the same time to enter temperature adjustment of the coffee and steam boiler. Setting T1 is for the coffee boiler, setting T2 is for the steam boiler. The left button will cycle from T1 - T2 and then back to standard machine operation. The right button will enter the settings value, display its’ current value and allow you to change it. If you press the right button while on T1 “202” (coffee boiler temperature) will display for a couple seconds. While the value is displayed the left button will drop the value 1 and the right button will raise the value 1. While the machine is off: hold down the left and right PID buttons and turn on the machine. Hold down the buttons until F. 01 appears. From here the same rules apply for the standard operation programming mode, you can cycle through the menu with the left button and access the settings value with the right button. We highly recommend leaving these value alone as we have preset them. The only setting we recommend changing is F. 02 which is the 15 - 20 amp mode setting. F. 02 set at 4 will run the machine in 15 amp mode and F. 02 set at 6 will run the machine in 20 amp mode. • The gauge on the left is for your boiler steam pressure. After turning the machine on it will take approximately 15 minutes before the gauge will show any pressure. Once up to pressure the gauge will cycle back and forth roughly between 1.2-1.6 bar depending on the steam boiler temperature setting. Should you need to adjust the steam pressure please refer to the PID section of the owner’s manual. • The gauge on right is for your pump (brew) pressure. When sitting idle the gauge is reading trapped pressure in the system and may vary. To get an accurate pump pressure reading, activate the pump by lifting the brew lever. You may also check the pump pressure by installing your backflush disc in the portafilter and lock it into the grouphead and then raise the brew lever. After a few seconds, the pressure should rise to about 9 bar. When you make espresso the pressure on the gauge will be slightly less at about 8.5 - 9. bar which is normal. This can be helpful in setting up your grinder. If your pressure goes to 9 bar with the backflush disc, but when you make espresso it is less than 8 bar then that means you need to go finer with your grind which will create more resistance to raise the pressure. Should you need to adjust the pump pressure please refer to the maintenance section of the owner’s manual for instructions on setting the pump pressure. • On the front of the machine, there are 4 indicator lights. The white indicator lights illuminate whenever the coffee boiler or the steam boilers are turned on. • The Red indicator lights indicate when the boiler is heating. It is normal for these lights to flash rapidly back and forth when the PID is maintaining the proper temperature in both boilers. • The machine is equipped with a rotary pump that is mounted underneath the motor so as to protect the motor in case of pump failure. • Periodically the pump will come on by itself to maintain the proper water level in the boiler. Sometimes the pump will come on when you turn on the machine and sometimes it may not depending on the water level in the boiler which is normal. • The pump (brew) pressure is regulated by the expansion valve. To learn how to set the pump pressure, please refer to the maintenance section of the owner’s manual. • The water reservoir can be accessed by opening the hinged reservoir door on the top of the machine. It is recommended that the reservoir be removed prior to filling to prevent the spilling of water inside the machine which can cause damage to sensitive electrical components. Should water accidentally get spilled inside the machine then immediately turn the power switch to the off position and unplug the machine from the electrical outlet. Do not plug the machine back in until it has had at least 1 full day to dry out. If it does not operate after that time then unplug the machine and refer to the troubleshooting section of the owner’s manual. • The reservoir must be installed properly for the machine to function. The float inside the reservoir must be on the left side of the machine. Also be sure the reservoir is seated as far down as possible and the silicone hoses are not pushing the float down or the PID and heating lights will not turn on. • The machine is equipped with a magnetic float in the water reservoir to detect the water level. When the water level gets low the PID and heating lights will go out and the pump will no longer function until the reservoir has been refilled. • The reservoir should be cleaned at least once a week with mild dish detergent and rinsed thoroughly before use. DO NOT PUT IN DISHWASHER!!! • Depending on your water quality it may be necessary to periodically sanitize the reservoir or if you are using hard water and have a mineral build up inside. White vinegar can be used to sanitize and will also remove the mineral deposits that can accumulate. • Attach the braided water line to the back bottom of the machine using the provided fiber washer. Attach the other end to your water source using the provided John Guest fitting. The machine comes standard with a 3/8” John Guest fitting, but a 1/4” fitting can also be installed. To use the John Guest fitting the tubing needs to have a clean rounded cut using a tubing cutter or a sharp razor blade. Then insert the tubing into the John Guest fitting until it bottoms out. • If you are not going to be using the John Guest fitting then you will need to use the additional fiber washer and you will need to purchase a 3/8” male BSPP fitting. After connecting both ends of the braided water line, turn on the water supply and verify there are no leaks. • Before plugging the machine in, verify the steam and hot water knobs are closed and the brew lever is in the down position. • Plug the machine in and turn the main power switch to the on position. • The boiler filling indicator light will illuminate and the pump will come on to start filling the boiler. The boiler should fill in approximately 60 seconds. If the pump has not turned off and finished filling after 60 seconds then turn the main power switch off and wait 5 minutes. • After waiting five minutes then turn the main power switch on again. The pump should come back on to continue filling the boiler. If the pump keeps running for more than 45-60 seconds again then unplug the machine and check to make sure that the water supply is turned on. • After the boiler has finished filling then place whichever portafilter you intend to use into the group head. Then lift the brew lever to start the pump and keep the lever up until water comes out of the portafilter and then lower the lever. • The heating indicator light will illuminate and the machine will start heating up. You will hear some gurgling noises and a small amount of steam and water will be discharged into the drip tray. This is normal to allow for the release of air and the expanding of water in the boiler and heat exchange. 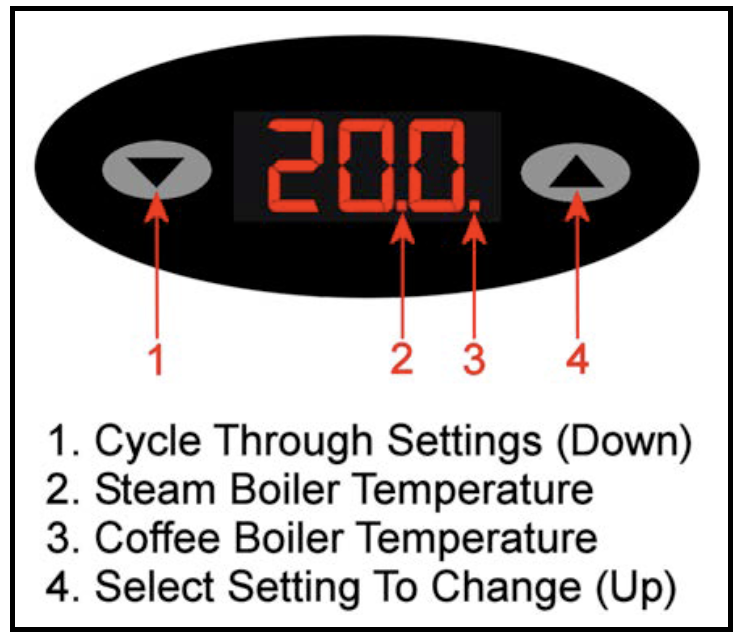 The function of a PID-Temperature Control is to regulate the temperature of the coffee boiler. The temperature of the boiler is programmable and controllable. The temperature, or rather the pressure of the steam boiler, is regulated by the pressure switch and is not adjustable from the outside. PID stands for “proportional-integral-derivative”. The PID-control displays the temperature of the coffee boiler. The PID controller’s display will cycle back and forth to show the current temperature of each boiler. The position of the decimal point (2+3) indicates which boiler the temperature is being shown for at that time The picture to the right shows which boiler is represented by which decimal point. The left button is used to cycle through the various settings and the right button allows you to select a setting to change. After selecting a setting to change the left/right buttons must be pressed within 2-3 seconds or the display will revert back to the previous setting. Warning - This section allows the user to change the machine from Fahrenheit to Celsius modeas well as other advanced settings that can greatly affect the performance of the machine. These settings have been calibrated using specialized test equipment and should not be changed unless the user has a thorough understanding of how a PID controller operates. To get into the advanced programming mode, with the machine turned off hold down both left/right buttons simultaneously and then turn the machine on. Keep holding the left/right buttons until the display reads F.01 and then release the buttons. Use the left button to cycle through parameters and then use the right button to select a parameter to change. Then use the left/right button to change the selected parameter. To save the new changes turn the machine off and then back on again. F.02 Mode Setting - By default the F.02 setting has been set to 4 (15 amp mode) to give priority to the coffee boiler. The setting can also be set to 6 (20 amp mode) to give power to both boilers. This can be helpful if you are steaming larger quantities of milk and desire more steam capacity. If you change the F.02 setting to 6 to power to both boilers, then both power switches must be on for the machine to operate or neither boiler will heat up. E1/E2 Offset Setting - The coffee boiler offset setting has been calibrated using a special Scace device and should not be changed. 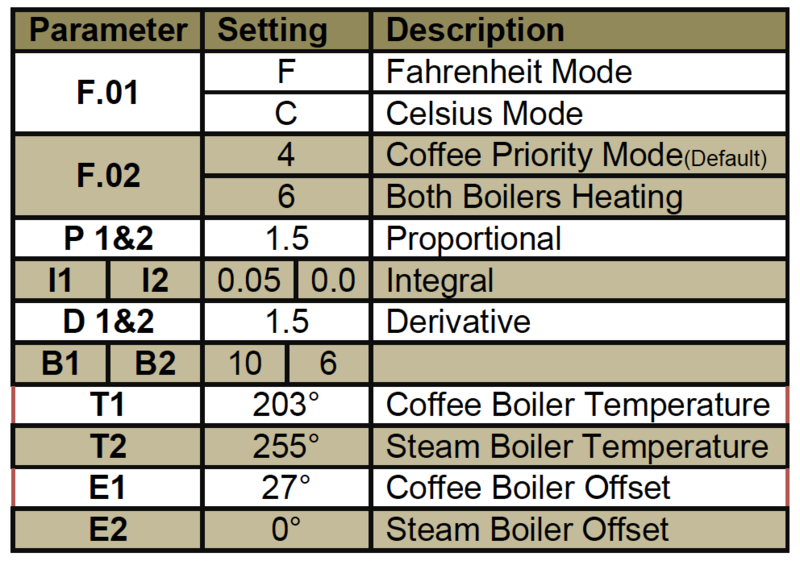 The steam boiler offset setting is set to 0° by default. It can be changed up to 5° to increase the steam pressure, but the pressure may vary at higher elevations so make sure it does not exceed 2 bars of pressure or damage may occur. Note - The PID controller and heating lights will turn off when the reservoir is empty. • The hot water wand uses the steam pressure to push the hot water out of the boiler so the steam boiler must be up to temperature before it is able to give any hot water. • To use the hot water wand, position the cup or pitcher under the wand and then open the hot water knob. Once the water has reached the desired level then close the knob. Important: Do not remove more than 6oz. of water at any one time until the machine has had time to refill the boiler. Failure to do so may cause damage to the heating element and will not be covered under warranty. Warning: The water from the hot water wand is approximately 250° and exits the boiler under force due to the steam pressure. Extreme caution is advised when using the wand or injury may occur. • Remove the grommet on the right side of the machine to expose the pump adjustment screw shown on the picture to the right. • Raise the brew lever and then turn the adjustment screw labeled “B” Turning clockwise will increase the pressure, counterclockwise to decrease the pressure. Recommend setting to 9 bar using the lower pump gauge as a reference. • After setting the pressure, lower the brew lever and then tighten the locknut labeled “A” Note: After adjusting the pump pressure then you may also need to adjust your grinder. • Raise the brew lever and then wait a few seconds for the pressure to rise. After the pressure has risen, use a flat blade screwdriver to turn the pump adjustment screw. 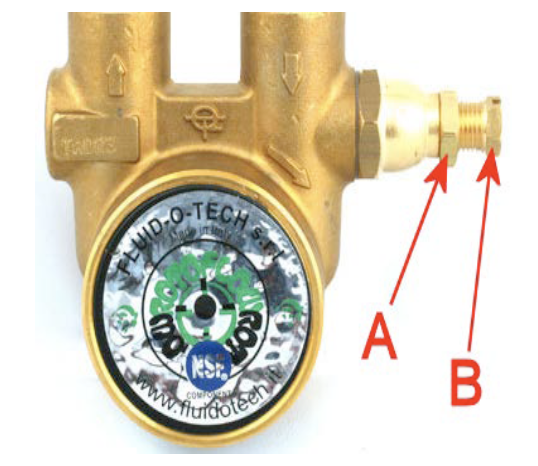 Turning clockwise will increase the pressure, counterclockwise to decrease the pressure. • The recommended setting with the backflush disc is 9 bar. When you make espresso the pressure may be slightly less due to less resistance. • If the machine is able to put out 9 bars of pressure with the backflush disc, but when you make espresso the pressure is less than 9 bars, this means the grind needs to be adjusted finer which will create more resistance to raise the pressure. It is normal for the grinder to drift a little over time and using different coffees or depending on the freshness of the coffee may require a minor grind adjustment to stay in the preferred brew range. • Descaling is the process of running a descaling agent such as citric acid through the machine to remove the accumulation of mineral deposits. • If you are using softened water then it should not be necessary to descale the machine. • Often times descaling can cause more problems than it solves. It can react to the minerals and foam over ruining electrical components. If the solution is too strong it can cause the chrome plating inside the group to flake off and get in the coffee or if it’s too weak it can dislodge minerals and cause a blockage. Please contact us before attempting to descale the machine, as we are not able to provide free warranty parts and labor if it is done incorrectly and causes damage to the machine. • The PID controller does not require any maintenance, but if the buttons have not been used in a long time then the contacts inside the controller can become oxidized and the buttons may no longer work. • To resolve this issue with the machine turned off, rapidly and repeatedly press the up and down arrows over and over again. Do this for up to a minute and it should help clean off the contacts and the buttons should start working again. • Specialty stainless steel cleaners can be used, but glass cleaner works well also. If there are dried up water stains then they can be cleaned with white vinegar. The fastest and sometimes most effective way is to simply pull some hot water off of the water tap onto a microfiber towel and give the machine a quick wipe down to prevent coffee stains from building up. • After cleaning the machine using a dry lint free cloth to buff the machine will provide a nice mirror finish to the stainless steel. • Make sure the coffee boiler and steam boiler power switches have been turned on for at least 15 minutes. • Check the upper gauge for steam pressure. Pressure should be around 1.2-1.7 bar. If the gauge is at zero then refer to the “Not Heating” section of the troubleshooting manual. If the pressure is good then continue with steps below. • Check the steam tip for a blockage. Clean steam tip holes with a paper clip. 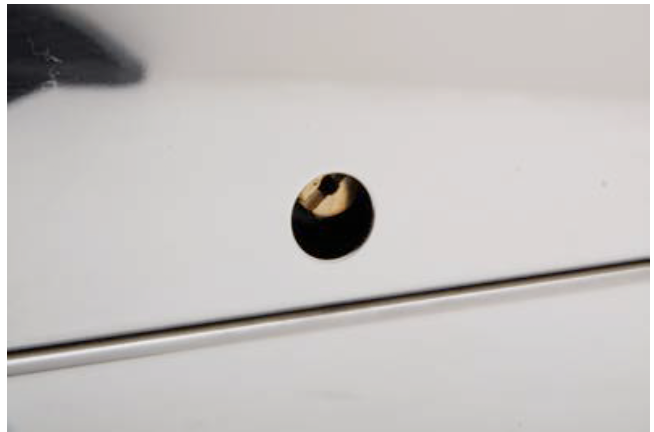 • Check the steam wand for a blockage by unscrewing the steam tip from the wand. Check the inside of the steam tip for dried up milk and then make sure the white teflon tube in the steam wand is also free of dried up milk. • Check the upper gauge for steam pressure. Pressure should be about 1.2-1.6 bar. If the gauge is at zero then refer to the “Not Heating” section of the troubleshooting manual. If pressure is good then continue with steps below. • Check the hot water knob for proper operation. Remove the end cap on the end of the hot water knob. Check to make sure that the c-clip shown in the picture above is attached. • Verify the machine is plugged into the outlet and the outlet has power. • Make sure the coffee and steam boiler power switches are both turned on. • Make sure the water reservoir is filled with water and the silicone hoses are not pushing the float down in the reservoir. • Check the resettable hi-limit switch on each boiler. To do so unplug the machine and then remove the outer shell. Using the pictures below as reference try firmly pressing the reset button on each boiler. • Make sure the coffee and steam boiler power switches are turned on. • Make sure the water reservoir is filled with water and is fully seated as far down into the machine as it can go. • Make sure the white float in the reservoir is on the left side of the machine and the silicone hoses are not pushing the float down. • If the PID buttons are not used too often then the contacts can become oxidized. To resolve this issue with the machine turned off, rapidly and repeatedly press the up and down arrows over and over again. Do this for up to a minute and it should help clean off the contacts and the buttons should start working again. • Install the backflush disc into your portafilter and then lock it into the group head. Raise the brew lever to check the pump pressure. Recommended setting with the backflush disc is 9.5-10 bar. Adjust the pump pressure if necessary. Please refer to the maintenance section of the owner’s manual for instructions. • If pump pressure is good then try adjusting the coffee grind coarser. • Make sure the longer silicone water line in the reservoir is at the bottom of the reservoir below the water level. • Make sure the screen on the end of the silicone water line in the reservoir is not clogged with debris. • Be sure the insert basket is not overfilled with coffee and you are tamping with no more than 30lbs of pressure. • If pump pressure is good then try adjusting the coffee grind finer. • Be sure the insert basket is filled with the proper amount of coffee and you are tamping with 30lbs of pressure. The LUCCA M58 comes with a 2-year warranty starting from the original date of purchase to protect against defects in materials or workmanship. The warranty is void if the product has been damaged by abuse, neglect, or modification. The warranty is provided by Eight Ounce Coffee. To begin a warranty claim, please contact us at hello@eightouncecoffee.ca or (403) 457-9844. Please remember: Save the shipping carton and all the packing material that came with your machine. This is very important should you need to return your machine to us. If you do need to send your machine back for any reason, you must first call your distributor and obtain a Return Authorization number prior to shipping. Be sure to ensure your machine and pack it securely. We can’t be responsible for any damage that might occur while in transit to us. Properly packing your machine with the original carton and packing material minimizes this possibility. Should it be necessary for you to file a damage claim with the shipper, we will, of course, be happy to assist you with the required forms. Now you're ready to start pulling shots! Check out this All About Coffee & Milk section to learn about steaming milk, latte art, our suggested starter espresso recipe, grinder dial-in tips and much more! This content has been provided by our friends at LUCCA and Clive Coffee and adapted with permission for re-use.